Walgreens SaturDate with Beauty 2/11 | A Savings WOW! 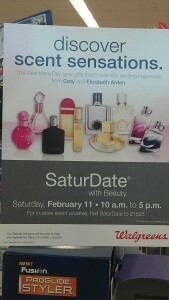 Walgreens is having a “SaturDate with Beauty” on Saturday, February 11th, from 10 AM to 5 PM. They will be featuring fragrances from Coty and Elizabeth Arden. Before you head out to Walgreens, make sure to check out the current deals and matchups for this week. Don’t forget to call your local Walgreens store to make sure they are participating before heading out.